I'm linking up with Helene today for her Blogtober challenge. Today's promt is my biggest fear. 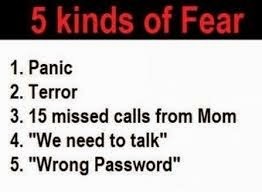 Fear is a weird thing. Its something that varies from person to person. For example, sometimes I feel like the only girl in the world that doesn't have a fear of spiders. I do have a mild paralyzing fear of the dark. I don't like not being able to see what is hiding in the shadows. That is seriously the moment that a zombie, vampire or crazy escaped psycho will come to kill you. I wouldn't even remotely consider that my biggest fear. 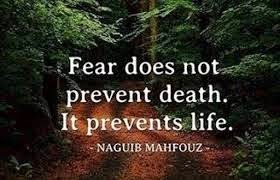 I fear falling, car wrecks, house fires. 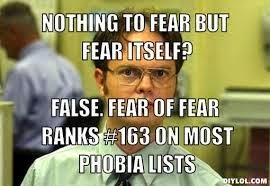 But those aren't my biggest fear. I fear snakes, lack of cell service. oh, especially lack of cell signal. I have become way to reliant on my phone for everything. Just the thought of not having service sends me into a panic. But that's not my biggest fear. I fear making a huge financial mistake that empties my bank account. I fear losing my home, living in my car, and eating from a dumpster. But even that is not my biggest fear. My biggest fear is something out of my control happening to my kids. When Abbey was really young, I read a blog (Back in the babyhood years of blogging) of a mom whose daughter had cancer. I held Abbey as I read about the passing of her daughter and couldn't wrap my head around what the mom must be feeling. But, my fear for them goes beyond cancer. Anything that can cause them extreme pain, suffering or death terrifies me. Its a hard balance of letting me them independent people that have some freedom to grow and learn and lock them up in a bubble and keep them safe from everything negative that might be out there. Its far scarier than anything that might me lurking in the shadows. The fear of losing cell phone service is real, I depend on mine way too much... especially considering if I lost service I'd probably be lost! Cancer/sickness in loved ones is definitely a scary thing when there's nothing you can do except be with them. Yeah, I'm with you on the whole loved one suddenly getting terminally ill thing. But since I want to keep this lighthearted, I'll just say it's clowns. Something about those dead eyes looking at you through a cheesy smile... it's not kosher. I fear a lot of what you mentioned. I especially hate spiders. I can understand your biggest fear. I don't have kids, but I can see where you're coming from on that. It would be scary for something to happen and to not have any control! I actually have a fear of lack of control in general, but it dose lean heavily toward the kids. I once had a neighbor that was a clown. It was terrifying. I kept thinking of John Wayne Gacy who was a clown, and a serial killer.